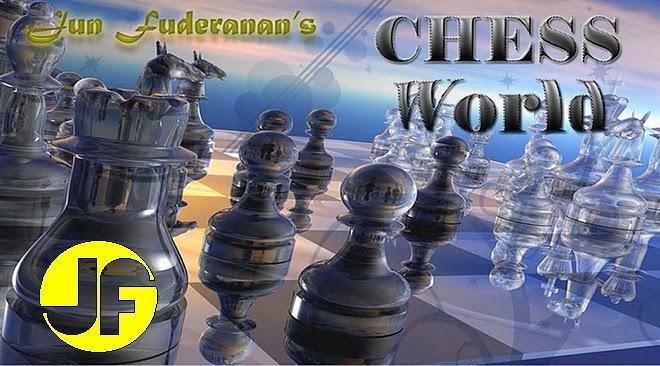 In chess sometimes sacrifices have to be made in order to gain rapid development and attain an attacking position. In the posted game, an attack ostensibly aimed at Black's queenside suddenly turns into an attack on the other wing. The explanation: superior mobility. Stronger is 7....c5, allowing Black to equalize. This move drives White's Knight to a5 where it will make inroads to Black's position. Now, White threatens to win a Rook with 13. Nxe7 and 14. Qxa8. Protecting the Rook. If 12....Bb7, White still wins a piece by 13. Nxe7. Black cannot take the c6 Knight because of 14. Nxf6 winning the Queen. 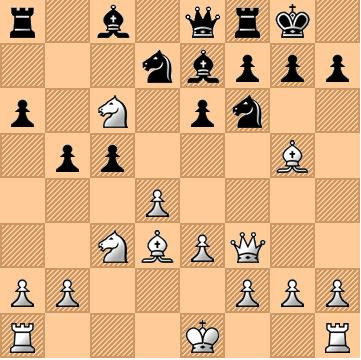 An interesting situation develops after 13....Bb7, 14. Nxe7+ Qxe7, 15. Nxf6+ gxf6, 16. Qh5 with Black losing its Queen as 16. ...f5 is the only way to avoid mate. Black's position deteriorates. But 13....Nxe4, 14. Nxe7+ Kh8, 15. Bxe4 would leave White in tremendous material advantage. At this point, saving the Rook is not a solution. For if 15....Ra7, 16. Bxh7 Rxe7 (not 16....Kxh7, 17. Qh5 mate), 17. 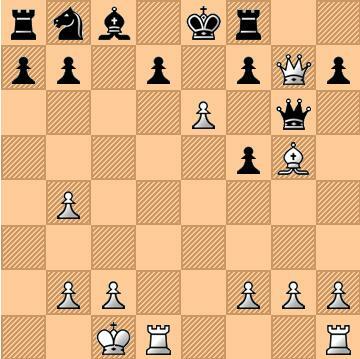 Qh5...., White wins with a mating attack. An elegant finish. The subsequent moves would have been 15....gxf6, 16. Bxh7+ Kxh7 (If 16....Kg7, then 17. Qxf6+), 17. Qh5+ Kg7, 18. Qh6+ Kg8, 19. Bxf6 Ng6, 20. Qg7 mate. The aggressive Pin. Koch Variation. White gives up some pieces in exchange for an attack on Black's King side. The Queen could not be taken. If 15....Qxg7, then 16. exd7+ Bxd7 (or Nxd7), 17. Rhe1+ Be6, 19. Rd8 mate. White's Queen is still invulnerable because of the threat 18. Rd8+ Nxd8, 19. exd8=Q+ mate. If 18....Kxd8, then 19. Qxf8+ Kc7, 20. Qxe7+ Bd7 (Not Kb6, 21. Qc5+ Ka6, 22. Qa5+ mate. ), 21. Bf4+ Kb6, 22. Qc5+ with the same mating attack. Typical of the this variation. 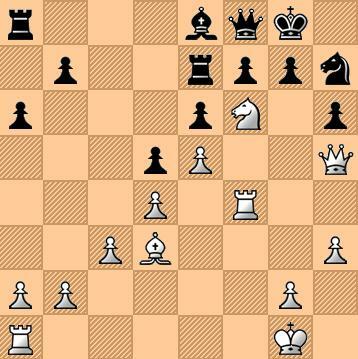 Black surrenders the center in exchange for disrupting White's central pawn structure. Black wants to eliminate the d4 pawn. This move is both a defensive and attacking move. White threatens dxc5, winning a pawn. Black takes the poisoned pawn. The move allows the White Bishop to take up an attacking position. Another bad move. Black meant to get rid of the pesky Knight so that somehow he can catch up in development. 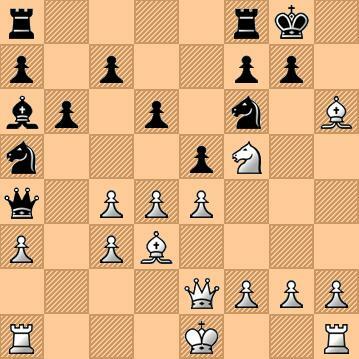 Notice that White's development far exceeds that of Black. Notice further the open e-file which would be crucial to the outcome of the game. A tempo making move. Any other Bishop move would have had a defensive reply. Now, there is no more time for this. Black must take the Bishop. If not, White moves 15. Bxc6 then 16. Qd8 mate. The beginning of a breakthrough. White's sacrifices are showing results. If 15...Be6 then 16. Qd7 mate. 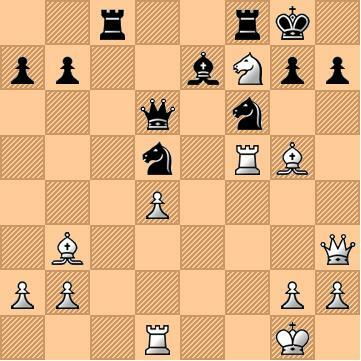 If the Bishop is taken, then White answers 17. Qd8 mate. A superb ending! White must have had all these in mind while offering sacrifices.